Most road crashes with other vehicles occur because one or both of the drivers involved did not see the other vehicle in time to take appropriate action. There are five rules for using your eyes more effectively and efficiently. Look well ahead when driving your vehicle. Steer the vehicle using your lower fringe vision. Look in the direction you want the vehicle to go, especially in bends and corners. Don't fix your eyes on any single object for more than about 2 seconds. Keep moving your eyes from object to object otherwise danger could threaten your vehicle from another source without you being aware of it. By moving your eyes, you are able to check the far distance, the middle distance and the near distance directly in front. In addition the mirror should be checked on average at least once every 10 to 12 seconds. This constant checking ensures that the driver is fully aware of everything that is going on around the vehicle. When driving, always have a plan of 'escape' should the traffic conditions quickly change. If a vehicle is tailgating,leave more space in front of your vehicle as this reduces your braking requirements. Offset your vehicle where possible to the vehicle travelling alongside. This allows space for other vehicles to 'escape' if they should swerve suddenly. The law requires all drivers to allow a minimum of 1 metre clearance, 1.5 metres if travelling over 60 km/h, when passing bicycle riders. 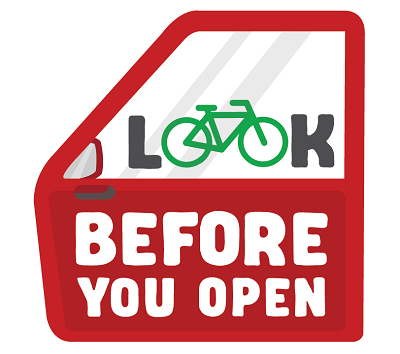 When you park on the side of a road, before opening the car door, look behind and over your right shoulder to check for bicycle riders. One way to do this is to open the car door with your left hand, this is known as the Dutch Reach. The Rules of Observation should be used in conjunction with the System of Car Control. Identification of hazards, checking for cross traffic at the appropriate time, use of mirrors and blind spot checking in the appropriate situations are examples of conforming to the Rules of Observation. Remember, when approaching danger (any hazard) keep slowing the vehicle until you can see clearly that it is safe to go before selecting the appropriate gear to proceed.